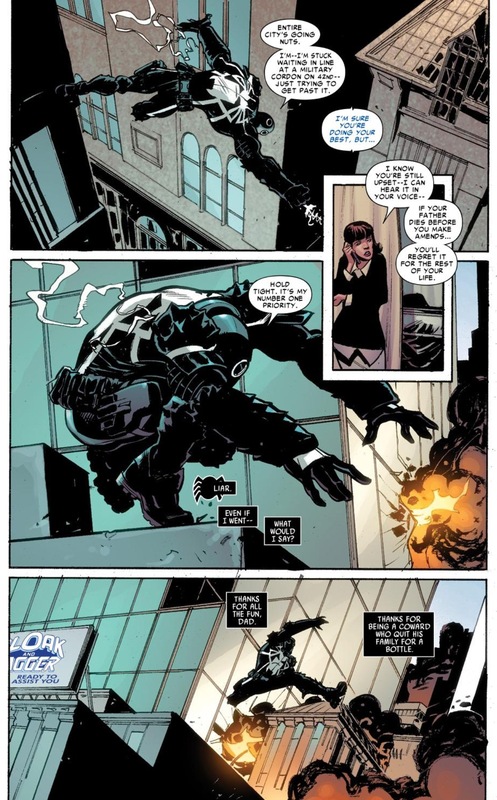 Since the Venom series kicked off earlier this year, writer Rick Rememder has continually found new and interesting ways to challenge typical definitions of a comic book “good guy” using Flash Thompson as the military-sanctioned “Venom for Hire.” In Venom #7, the second-part of the series’ tie-in with Spider Island, Remender may have crafted his best issue yet as he brings in the original Venom, Eddie Brock (now Anti-Venom), to really play with the concept of good and evil and which side Flash/Venom is actually on. The Spider Island storyline was also a logical place to bring Brock back into mix as his “Anti-Venom” properties sap whoever he comes in contact with of their superpowers. 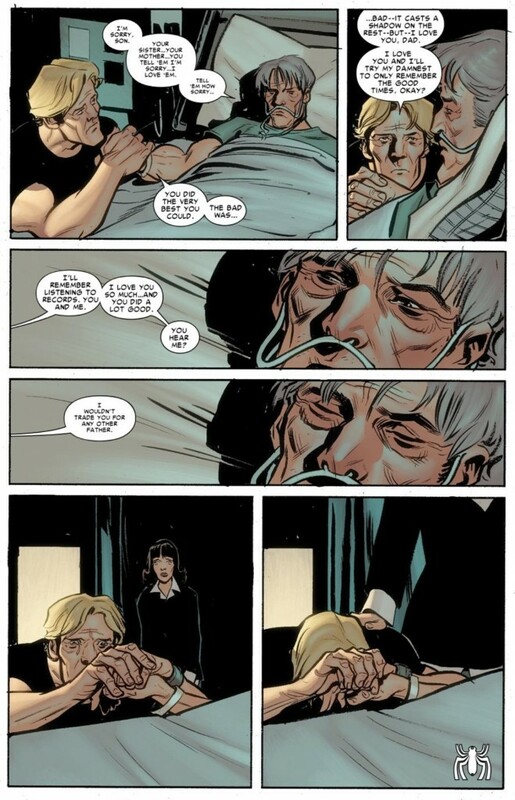 Placing him in a church where he goes all evangelical healing those infected with the Spider Island virus, was delightfully cynical and funny, and is just another way Remender blurs the lines between traditional “good” and evil characters. There’s clearly something creepy about the way Anti-Venom is trying to independently “heal” all of these New Yorkers, yet as we learn by issue’s end, he’s more than happy to supply his powers to Reed Richards who’s working on a cure for the virus. If only that blasted Flash/Venom wasn’t such a big jerk about it. As I’ve said in previous posts, Flash Thompson is a really fascinating choice to be the new Venom just because he’s such a complicated character with a lot of mental and emotional issues. And while in recent years Flash has functioned – in human form – as a good guy, he also has the past honor of being one of Peter Parker’s main antagonists and bullies who I’m sure many readers wanted to see get his comeuppance throughout the 1960s. 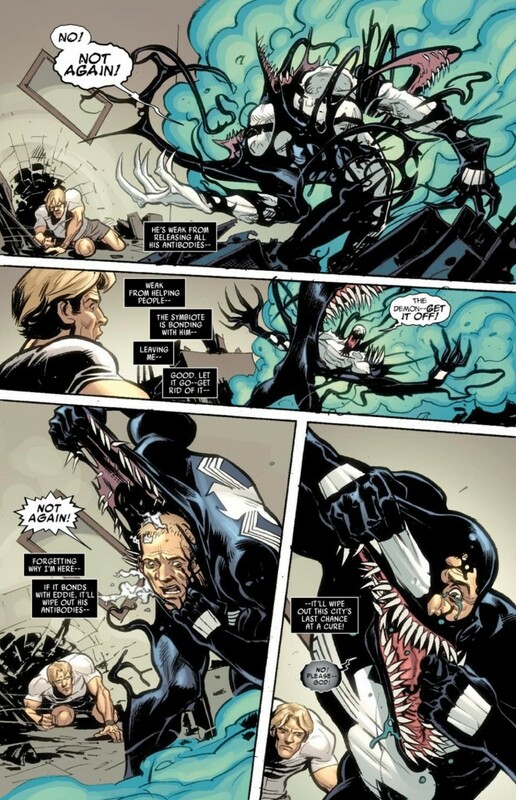 Since Flash is now a paraplegic war veteran, giving him the often-sinister power of the Venom symbiote as a government mercenary is a surefire way to make the character drunk with physical power, thereby pushing him back to his darker roots. While operating as Venom, Flash thinks of himself as the “good guy” who’s totally in control. But he’s constantly demonstrating ways that he’s not. 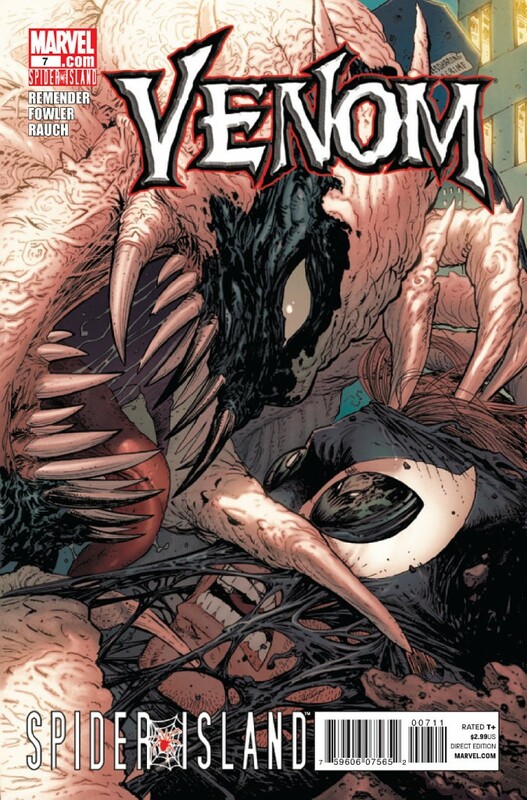 Like when the site of the symbiote’s old host Eddie Brock drives it crazy in Venom #7, and Flash ends up physically knocking Anti-Venom out to bring him back to the Baxter Building and the Future Foundation. When Eddie Brock is sitting there and accusing your character of having a few screw’s loose, then you know you’re in trouble. What we’re learning is that the dark power of the symbiote is just too much to overcome for any character who becomes its host. After being rejected by Peter during the 1980s Amazing Spider-Man run, the symbiote has become too emotionally unstable and thereby pines to control whoever ends up wearing it. Because the symbiote is opportunistic, it’s prepared to use whoever is seeking its power the most, regardless of the person’s true intentions. Because Flash would be rendered physically powerless without the symbiote, the suit allow him to think he’s capable of controlling it for the force of good, while it continually feeds and destabilizes his emotional state. And while Brock continues to come across as a lost-cause mentally, especially when he’s in the company of his old symbiote-costume, being free from Venom allows him to have a better grasp of his good intentions. And public perception continues to project a false reality. With Brock’s troublesome past, Mr. Fantastic is quick to assume since he was forcefully brought to the Baxter Building by Flash, he must have physically resisted the chance to help others in some way. And since Flash/Venom is a “good guy” on paper, it’s leading Reed and others into forming an alliance with a clearly unstable individual with potentially violent tendencies. How’s the interior art? As awesome as the cover? Same artist? We’ve been on the fence about picking up this title but you make it sound fun. We liked the 2003 series a LOT. Not much for any other Venom series.